Architec’s HotGrips are so flexible and squishy that they provide almost the same tactile experience as grabbing a hot pan with your bare hands. Except, of course, your hands won’t bet burned when using a HotGrip—they can safely be used to grip items up to 600° F (315° C). HotGrips are dishwaher safe and make for good, nonskid tabletop trivets too. From the top it looks like an average (if especially colorful) cutting board. From the bottom Architec’s Gripper looks a little like a flat over-sized LEGO piece. That’s because the underneath of these boards are covered in nonskid grippers that will keep the board in place even while you are cutting at an angle or when the board is placed on a wet surface. The Gripper is made from an odor-proof material that can go right from the countertop to the dishwasher. Plastic, glass or ceramic mixing bowls? Some cooks feel strongly towards one. The advantage of plastic bowls: they are light in weight and easily molded in the manufacturing process and so often tend to include extra features like handles and spouts. The key is to get a bowl made of a melamine plastic. 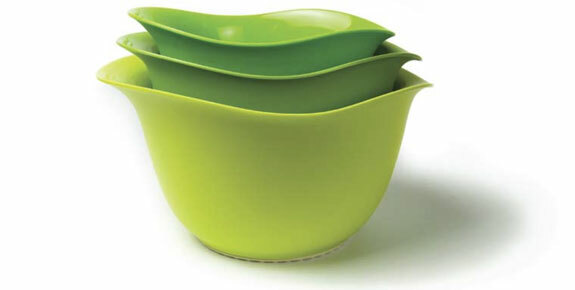 Nonmelamine bowls tend to absorb stains and odors. And what cook wants the cream dessert they are whipping up today to taste of the fish marinade they mixed up last night? 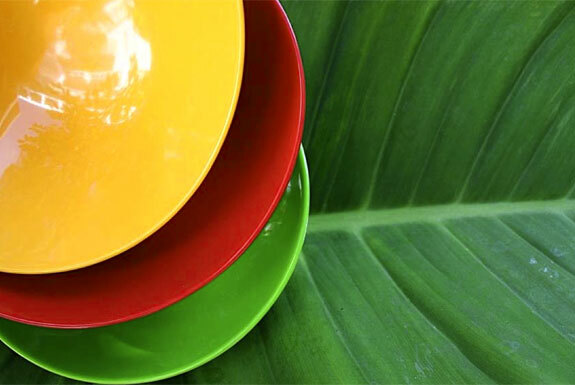 Architec designs our favorite plastic mixing bowls. They are made from a durable dishwasher and freezer safe melamine. The bowls are weighted on the bottom and have a base lined with a slip-proof material, making these bowls perfect for kids—or adults with the clumsiness of kids. I am trying to find bowls that are cool to touch on the outside of the bowl. I work with developmentally disabled and we are afraid they will burn themselves on regular bowls when passing them at mealtimes.